Watch the YouTube Video LinkedIn Training or read below. Welcome to the second installment of LinkedIn profile tips and training. I always like to add that a lot of this is best understood over video. The first installment showed you how to update your LinkedIn Profile url and how to update your company link. In what follows, I attempted to make this video quick and get to the point because I know we’re all busy. 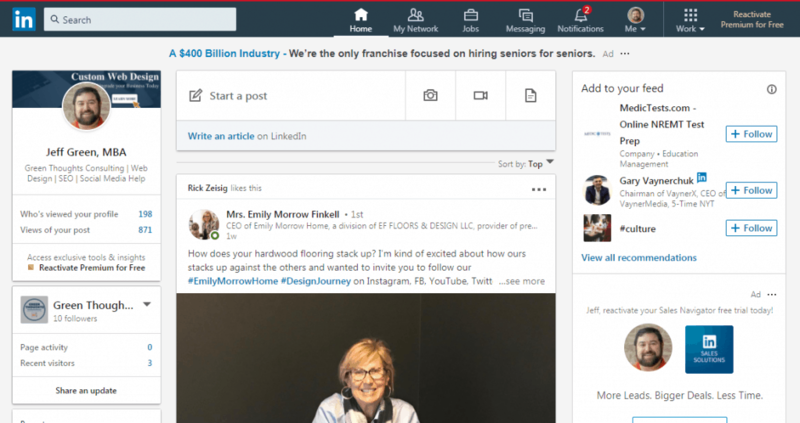 To begin with simply go to your LinkedIn home page and then to your profile. Click on your profile in the top left below the tool bar at top. If you are signed in to LinkedIn you will automatically be in edit mode. I’ve provided another screenshot of the area we will be discussing today, just below. 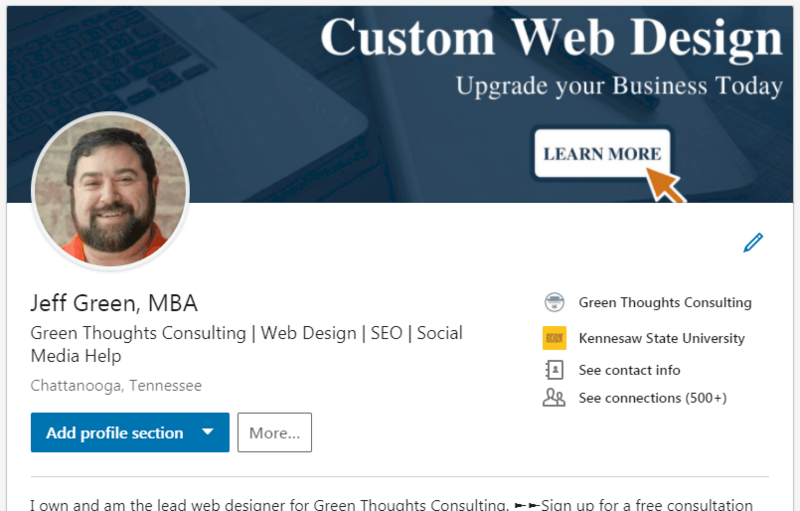 In our LinkedIn Profile Tips and training today I want to focus on top “box” of your profile, which I’m defining as the section from your custom header to the divider as seen in the above screenshot. If I don’t cover something fully or you have lingering questions let me know with a comment or email and I’ll be glad to help you out. There are several very important items in this area. When you are choosing a profile picture for LinkedIn, and really any Social Media outlet that might bring business or networking value to your life, above all else you want it to be professional. I personally believe the best thing to do is to wear clothing similar to what you would be wearing if and when you are actually at work. This means if you wear a three-piece suit you should be in one in LinkedIn Profile picture. However, if like me you tend to wear polos or button downs then you should be in one in your picture. I’m not going to get detailed and tell you what to wear exactly just be yourself. However, please don’t do these this! 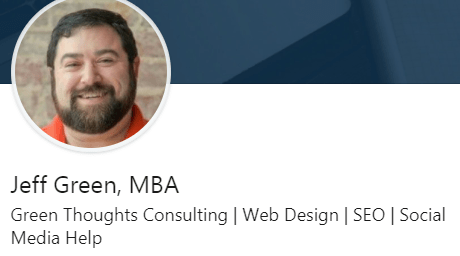 The photos provided below are from a great post on Andrew MacArthy’s blog titled “10 Examples of Terrible LinkedIn Profile Photos | Bad LinkedIn Profile Pics“. Do Not Make these Mistakes! Just makes sure that people can see you clearly. It pays off to get a professional head shot or have a friend do it for you. With the quality of Smart Phones there is really no reason to have a poor quality head shot. So in this picture you can see that it’s just too far away. I wouldn’t notice this person if I walked right up to them. I mean I love hiking and mountains, but let people respond to your face and smile. Psychological studies have shown that people really connect with a nice smile. Show the world your lovely eyes and smile. You can find more on the Psychology at work here. It should go without saying, but please don’t use a picture of yourself in a Speedo, that two piece bathing suit, smoking a bong, or chugging beer. Use your brain. It’s a professional network and those types of activities are generally frowned upon at work. This one will fit in with the number 3 above. The idea is that you need to be looking into the camera and engaging the audience that comes to your page. You don’t want to waste that opportunity by looking down or away. It leads people to distrust you. Simple. Don’t use your business logo as your photo. I realize it may be tempting, but don’t. People buy from people not a logo. Unless you are Nike or Apple it is best to stick with a good head shot photo. Here’s a resource that provides meaningful and clear help on how to take a picture that is awesome with your smartphone. If you want tips on getting the most out of your own do it yourself head shot there is a nice article on that, which you can find on LinkedIn of all places and it’s written by Melissa De Witte. Melissa provides a nice outline of what to do and what not to do to get that perfect head shot with an iPhone. The name box is where you put your name. I’m guessing you knew that right! It is located on the pencil edit icon that is just below your header on your profile. When you click on the pencil icon a pop up will emerge with First Name, Last Name etc. If you are in an industry where you have certain credentials that can be advantageous to you then it is really a must to get them in this box. You don’t want that important information, which might differentiate you from another person, to be hidden in your profile. For example if you’re a CPA or if you have a MBA I would encourage you to add those credentials into the last name section as I’ve done below. Just update the last name section and hit save. The headline or title is located just below your name on your profile. It is probably the second most important item on your LinkedIn profile next to your picture. The information you put in your headline will show up in searches so there’s value there. Further, it is one of the first things searchers will see about you when they come to your profile. For these reasons you need to optimize it, however don’t go crazy. Tell me what you do, how you do, and be succinct. My current profile has my business name, and the three main areas where we help people. If you were in sales you might put something like Experienced Sales Professional | Change Catalyst or whatever verbiage describes you well. I believe it is better to add this language than to simply provide your title. The idea here is to make yourself stand out when people search in your area. You get to this section by clicking the pencil and scrolling down to Country and Zip code. You put in your zip code here. As a note it does not need to be your home zip code. Rather, I would use the zip code for the area you work in primarily. I have experimented with leaving this blank, but it reverts to the country and lowers your local value in searches. My advice is to use your work zip code or the area you sale in when on the road. If you have multiple areas choose the one you want to focus on or set up a reminder on your calendar to switch it from time to time to another territory. However, whatever you choose. Choose the area over city. You will notice that when I put in a zip code in Chattanooga TN I am given two options. Choose the least restrictive option. Greater Chicago Area equals more people. During my research I ran across a nice article for those that work the entire country or globe. I won’t spoil the articles thunder. Go have a read when you are finished here. 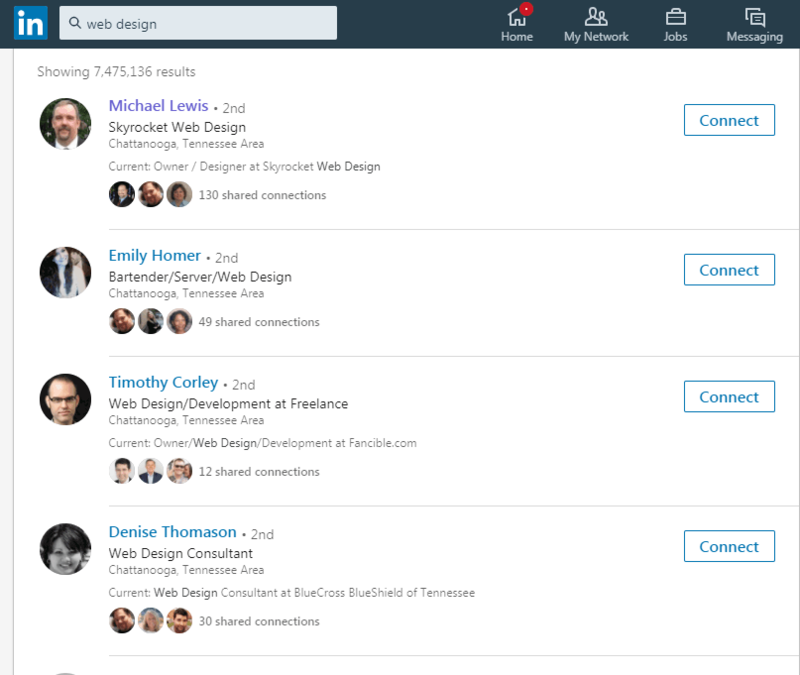 Your connections are what make your LinkedIn Profile useful. You can send and request a connection with people that are connected to one of your connections. So it is a good thing to have more connections. Add connections. There are three reasons I believe you should actively grow your network. First, a large network provides you with more connections to others. Having more 1st connections gives you access to all of their 1st connections and so on. Secondly, having a lot of connections means your posts and activity on LinkedIn are seen by more people organically. If you post and you are only connected to a few individuals your posts reach is hampered. However, if you post and have many connections you can get more organic traffic. 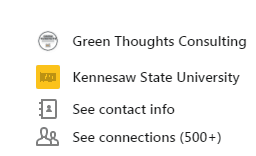 Finally, the third reason I think an optimized LinkedIn profile should have lots of connections is because the indicator on your profile tops at 500+. Your goal should be to get 500+ because of the above reasons I listed and also because it makes your profile look like you are someone to know and is kind of like a badge of honor. In conclusion, I covered 5 main areas to optimize your LinkedIn profile today. Each of these areas is important to optimizing your profile. If you are stumped or something I said was just unclear reach out in the comment box below or send me a contact and I’ll be glad to help out. I love helping small business owners bring an idea into being. Creating something that will grow the dream they have. I work for and own Green Thoughts Consulting. We live in Chattanooga TN and love it. Don't hesitate to reach out to me regarding Website Design, Search Engine Optimization, or Social Media Help. Never miss an update. Get our blog delivered daily to your email inbox. Start Today.